Water for watermelons! One of our ponds. This one replenishes the water table. Compared to this time last year, things are blessedly moist right now. The 6+ inches of rain we got at the beginning of the month of May <insert happy dance> has continued to promote explosive growth all over the farm. So here’s what it brought you for today at ARTfarm, 3–6 p.m.: Sweet salad mix, baby arugula, bunched arugula, a few pints of cherry tomatoes, a few slicer tomatoes, dandelion greens, Italian basil, garlic chives, parsley, freshly dug ginger root, French breakfast radishes, sweet bell peppers, serrano peppers, Indian chili peppers, yellow seasoning peppers, fresh cut zinnia flowers, good quantities of yellow and red fleshed WATERMELONS, loads of sweet and yummy papaya, passionfruit, a few dragonfruit, a few pineapples, and very fresh, delicate and very mild local goat cheese from Dr. Bethany’s Fiddlewood Farm alpine goats! Cray-cray…this watermelon is sweeeeeet! You can save the seeds for roasting like pumpkin seeds. A similar lineup to last week, with a slight mango alteration: Sweet salad mix, garlic chives, mint. From our partners: Haitian Kidney mangoes (and a few Nam Doc Mai mangoes) from Alex at Tropical Exotics, and vegan ice cream from I-Sha in summer flavors: passionfruit, breadfruit, jojo and banana. Open on the South Shore Road, 10am – 12 noon. We literally have less than a dozen bags of sweet mix to sell tomorrow morning, so if you arrive later you may only be able to pick up some mangoes, herbs and ice cream. Farmer Luca has not quite made a final decision, but we may close down early for our summer/fall break. We did get around half an inch of rain over this past week. Consistent winds have caused most of the moisture to evaporate quickly from the soil and plants, unfortunately. Much more will be needed to affect any kind of drought recovery, but we are grateful for and celebrating every drop that falls! Pastures at ARTfarm, Summer 2015. 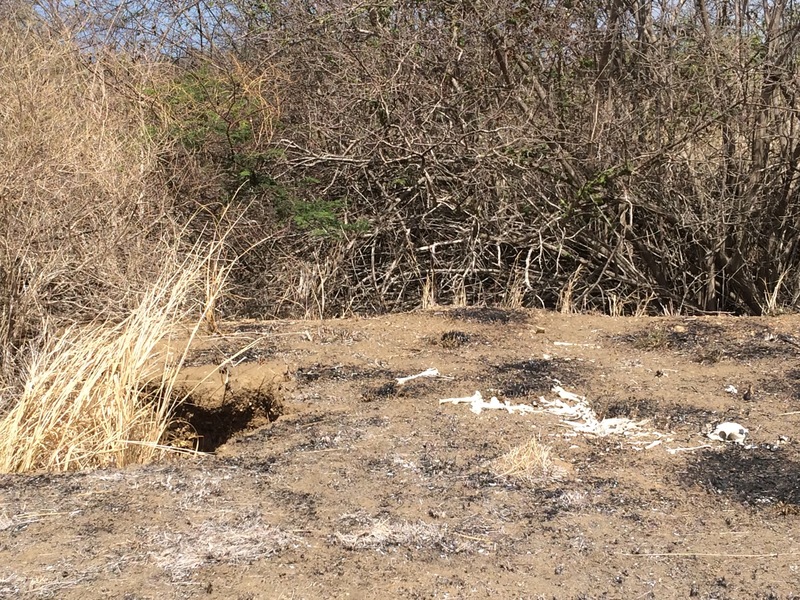 Extreme drought conditions, including brushfires, have caused a shortage of pasture forage that has negatively affected both domestic and wild creatures. Normally this riparian area of gut bank would be lush with guinea grass, various types of palatable broadleaf weeds, flowering shrubs and trees, and leguminous vines to provide an extensive and diverse diet plus shade and cover for birds, reptiles and wild mammals. Here you see barren soil and the bleached bones of a deer in their stead. While this is generally a dry period of the year, this amount of bare soil and the die-off of so many trees is highly unusual. 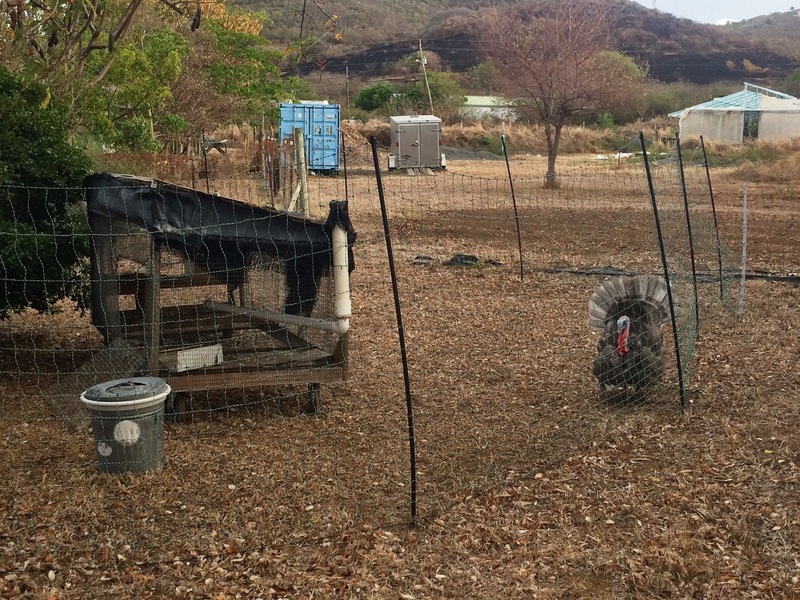 Many farmers in the Virgin Islands, particular those who are primarily livestock producers, are really suffering right now. The local and federal government agricultural agencies are working hard to find some drought relief sources for all of us but it may take some time (one timetable we heard about said not until December 2015). Some ideas for helping are in the works, and we will let you know if we hear of a secure and reliable way for the public to donate or otherwise contribute to help bring in emergency grain and hay to keep our island flocks and herds alive. If you have a contact working in the shipping/cargo business, or know of any stateside hay producers willing to donate or discount their hay, please pass their contact information on to us or to Dr. Bradford, Director of Veterinary Services at the VI Department of Agriculture. Also helpful in receiving help would be a fiduciary to collect and hold donated funds and a secure central distribution point for trailers of hay and feed. Almost as if by sleight-of-hand: Sweet salad mix, a few dragonfruit, garlic chives, mint, lemongrass. From our partners: Nam Doc Mai mangoes from Alex at Tropical Exotics, and vegan ice cream from I-Sha in summer flavors: passionfruit, mango, jojo and banana, papaya-ginger. Open on the South Shore Road, 10am – 12 noon. The severe drought continues. Many of the trees we have planted on the farm are dying off. Grazed pastures are not renewing themselves. After being blessed with rain for the last few years it is hard for many farmers on St. Croix to see our long term efforts of stewardship being stressed to the breaking point by this unusually harsh weather. Even as we see visible signs of the drought, there are many more organisms suffering than meet the naked eye. Water, water, anywhere? 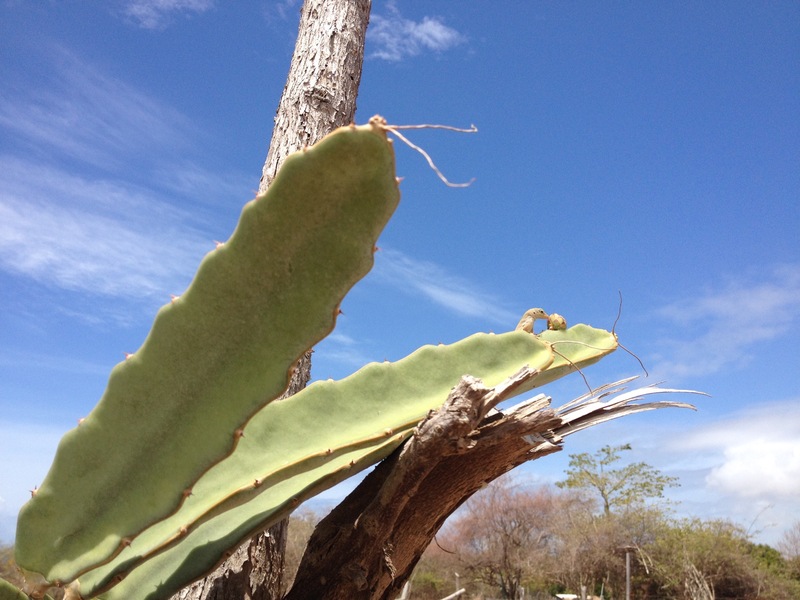 Look closely to see what Farmer Luca saw: A tiny anole lizard licking moisture off of an irrigated dragonfruit bud in the dry pasture. Despite the lack of green grass, bugs and other forage, our two surviving heritage-breed turkeys managed to breed this summer. We took a set of ten eggs for the incubator when Mrs. Brownie started to lay, and she took it upon herself to lay another set after that and brooded it. Turkeys are said to have a low hatch rate. The incubator hatched four poults, but the mother turkey hatched nine out of ten! Man cannot improve on nature’s efficiencies, it seems. Mrs. Brownie, who survived the dog attack this past fall, has produced nine poults this summer after 28 patient days on the nestbox. She and her babies are well protected at this bite-sized stage in a coop built to keep rats and mongoose out. Predator pressure is particularly intense during drought times as wildlife and feral animals are more desperate for food and water. Proud papa turkey, the only survivor of the stray dog attack last fall, keeps careful watch over his new family. You can see recent brushfire damage on the hills behind him. It’s July 2015 and there has been no substantial rain for months. This panorama of the center of the farm shows the contrast between irrigated and non-irrigated areas. The ARTfarm is brown and crunchy at the moment, (and not in the delicious granola type way) but there is a little patch of green that Farmer Luca is diligently watering and protecting from hungry, thirsty deer. 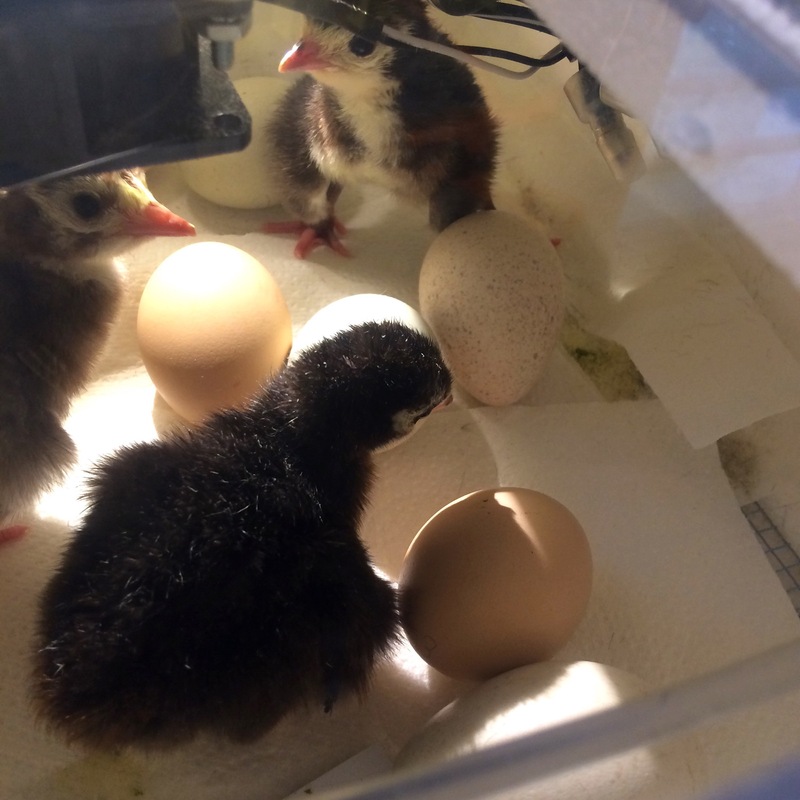 In other news from the Department of Symbols Of Hope, three turkey eggs hatched in our incubator yesterday morning! 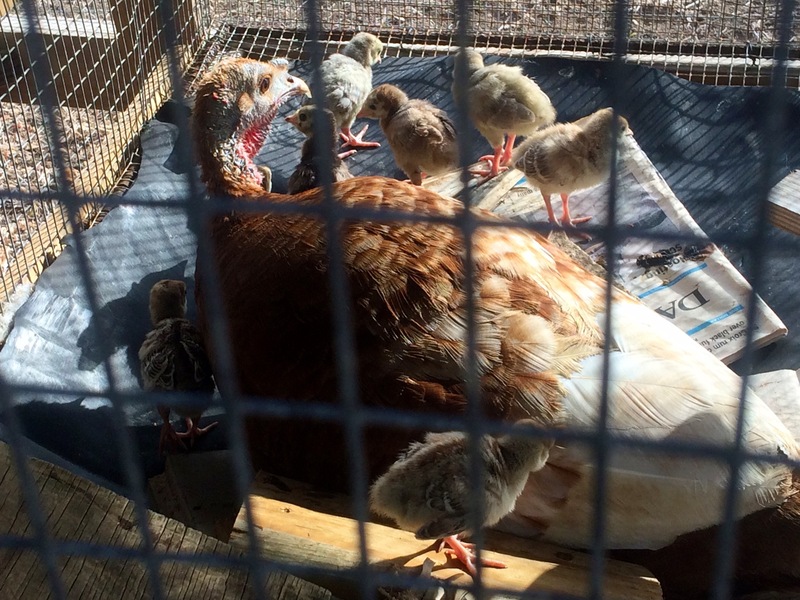 And our mama turkey Ms. Brownie is brooding on a nest of eleven more hope capsules…due next week. A morning meeting of three freshly hatched turkey poults in the incubator at ARTfarm. For this morning’s Saturday farmstand, from 10 AM to 12 noon, we have: Lots of sweet salad mix, passionfruit, plenty of mint, lemongrass, garlic chives, tarragon, Cuban oregano, recao, Ethiopian kale, and papayas! From our partner growers and chefs: we have dragonfruit from Solitude Farms, Viequen Butterball mangoes from Tita, Haitian Kidney mangoes from Denis Nash, and vegan local fruit ice cream from I-Sha. Don’t forget about the 19th annual Mango Melee on Sunday at the Botanical Garden! You won’t find the Viequen Butterball at Mango Melee, but there are a lot of other fun and delicious things on offer over there (call 340-692-2874 or www.sgvbg.org for more information). Be sure to support our long-time neighbor and loyal customer Lisa Spery as she competes in the Mango Dis, Mango Dat contest with a recipe incorporating fresh ARTfarm mint! Good luck, Lisa!